Questions have been raised over the standard of Sony's customer services after it was discovered that the victim of a PlayStation 4 hack would not be fully refunded the $600 that was stolen from him. If a PlayStation 4 loses its place as the primary console, users must wait six months to reverse the policy. "The Sony representative told me that they are only permitted to refund up to $150"
A Reddit user, going by the name Kadjar, explained that he awoke on Wednesday morning with a series of email alerts stating that about $600 of content had been purchased through his account. He also discovered that his PlayStation 4 has been deactivated from PSN and another system, of which the location is unknown, has seized control as the primary system on the account. Sony will only refund $150 of the $600 that was taken. The money will be in PSN credit, and not refunded into the bank. If the user escalates the payment dispute with his bank, his account will be banned. If his account is banned, his purchased licences for games, such as The Last of Us Remastered, will be wiped. If the licences are wiped, there is no way of restoring them. The user's PlayStation 4 cannot be designated as the primary console for another 6 months, meaning it is locked out of the account until then. Readers on Reddit have voiced outrage at what they consider poor protection from account hacks. Others have urged that this story highlights how important it is that users protect their account with a very strong password, due to the lack of protection should something go wrong. GameSpot has contacted Sony to discuss the matter or provide some clarification. 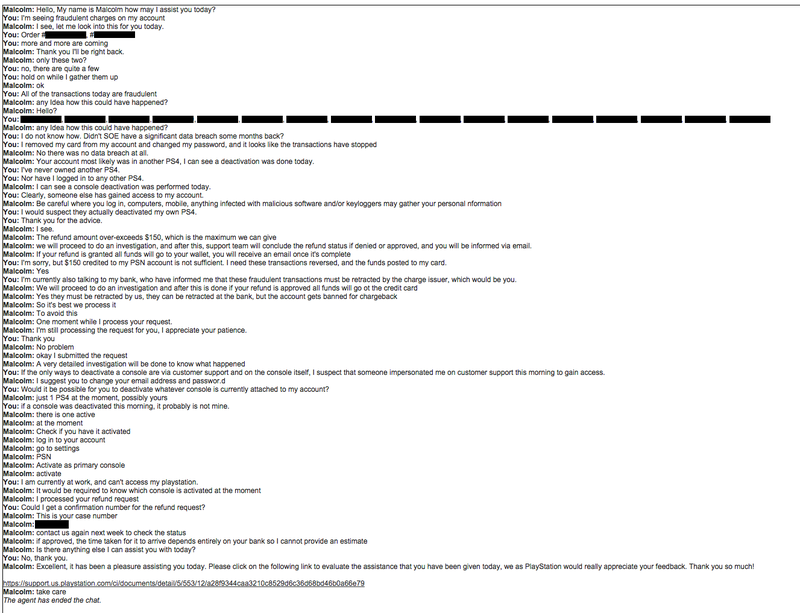 Kadjar has published images of his online chat with Sony customer services, and highlights three other cases where users have complained about similar issues. "This morning, I started receiving emails indicating a number of purchases on my PSN account. As the transactions came in, one-by-one, it became immediately clear that my account had been hacked. I immediately logged into PSN and removed my card from the account, changed my email and password, and simultaneously launched support chats with both Sony and my bank. "The Sony representative told me that they are only permitted to refund transactions of up to $150. 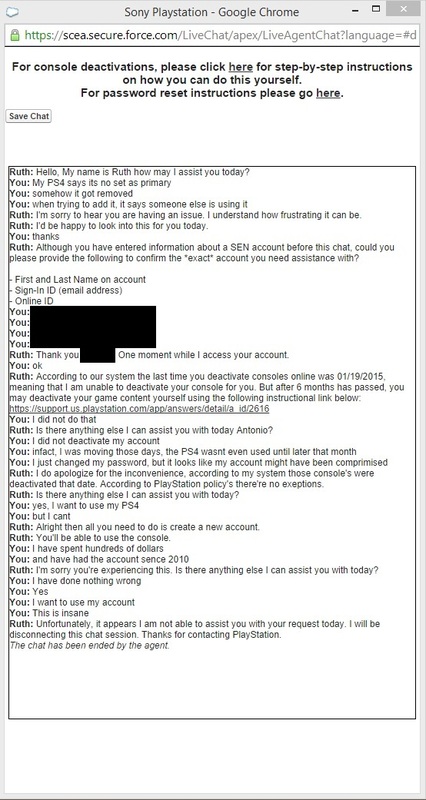 He also informed me that I could dispute the charges with my bank, but by doing so, my account would be banned from PSN. As a result, I would permanently lose all of my purchases, including the Last of Us Remastered. "He also informed me that my existing PS4 had been deactivated from the network this morning, and that a new one had been activated. When I asked him to deactivate that new, mystery PS4, he said he could not. I then turned on my PS4, logged in with my new credentials, and attempted to activate my PS4 with my account, but it informed me that I could not activate it as long as there was another PS4 bound to my account. "I called customer support, hoping for some clarification. The agent informed me that there is indeed a refund investigation underway, but that it will be limited to $150, and that it would be credited to my PSN wallet, not my bank account. "Furthermore, my account will not be able to activate a new system for 6 months, per Sony policy. I'm completely locked out of my own account until that date. I then asked about what would happen if I got my bank to reverse the charges, and he informed me that it would result in a banned account. I asked if there would be any way to restore my purchases, and he told me that there would not be, but I 'only have the Last of Us and a couple of the monthly free deal games,' so it's not a big deal." Several Reddit users have offered Kadjar copies of their games, which he has thanked them for, but declined. "My goal here is bring attention to a few of Sony's bad customer service policies in the hopes that they'll change them," he said.